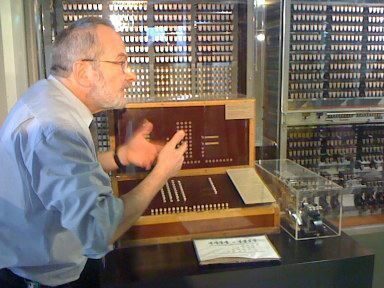 The Z3 by Konrad Zuse was the world’s first working digital Turing-complete computer. It did floating point arithmetic, had two registers accessible to the programmer, was microcoded, and clocked at about 5 Hz. The original Z3 was destroyed in the second world war. The Deutsches Museum in Munich has the only working replica, built by Zuse in the 1960s. Here is a video of a demonstration of the Z3, including a lot of biographical information on Zuse. If you speak German, you will be blown away by the wit of the presenter; if you don’t, enjoy the clicking relays! Zuse Apparatebau: Er kriegte sogar noch drei ArbeitskrĂ¤fte. Das waren die, die sonst keiner mehr haben wollte. Die Zuse-Firma bestand aus ihm selber, der Chef, dann ein vorbestrafter Buchhalter, ein blinder Mathelehrer – der hat die Filme gelocht… ja, der hat das Tag und Nacht gemacht – das war dem auch wurscht, ob’s Tag oder Nacht war. Und dann kam noch ein Konstrukteur aus einer Nervenheilanstalt. Was sehen wir an der Story? In der Branche waren immer schon die abgefahrensten Typen! This entry was posted in archeology on January 31, 2009 by Michael Steil. My German isn’t very good, but I hope I got half the jokes, thanx. Possible typo in your article: looking at the pictures, I think what’s shown is a first generation Microsoft Zune, not a Zuse.